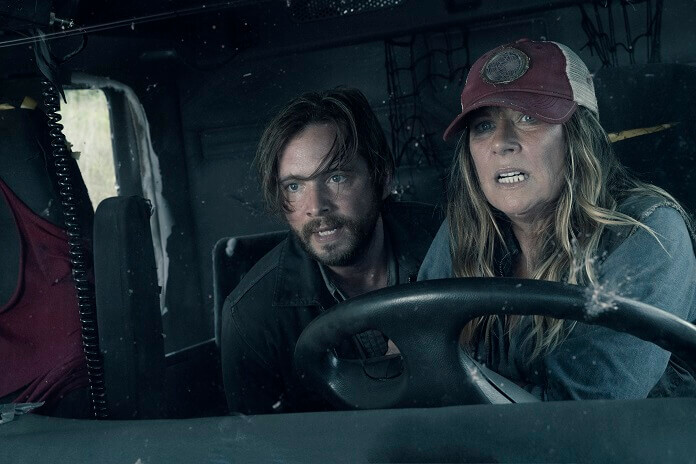 Fear the Walking Dead Season 4 Episode 14 Recap: "MM 54"
AMC’s Fear the Walking Dead season four episode 13 ended with the mysterious woman using Al’s weapons against the group. Season four episode 14 opens with a flashback to the mysterious woman (Tonya Pinkins) comforting her husband who’s been severely injured in a car accident. The woman, who it turns out is named Martha, tries to get cars to stop and help but everyone speeds by. Help never arrives and her husband dies. She uses a piece of glass to end his short time as a walker and then buries him not far from the road under a tree. She’s heartbroken and rages against his death. Martha begins her zombie-pet thing by killing every person who walks up and takes something from a box, using the newly created zombie to kill the next person. One innocent man who’s dropping off a box is questioned about the person who began the box program. He refuses to provide any details on Polar Bear before he’s bitten. Martha makes contact by radio with Morgan, who explains he accidentally hitched a ride in the rear of a semi. Back to current events, the sounds of gunfire end and Morgan (Lennie James), Al (Maggie Grace), and June (Jenna Elfman) struggle to sit up after hitting the floor in the back of the truck. Luciana (Danay Garcia) is unconscious, while in the cab Sarah (Mo Collins), Wendell (Daryl Mitchell), and Jim (Aaron Stanford) assess the situation. Martha turns Al’s van around and everyone hits the floor again. Instead of firing, Martha pulls to a stop behind the truck. Morgan determines they can’t stay inside the truck and helps the women exit the rear. Al immediately runs over to her van and a walker on a leash falls out and rolls on top of June. Al reaches for a knife but it’s actually Wendell who gets the jump on Martha. His wheelchair’s smashed but he’s able to shoot at Martha from his position on the ground. The semi catches on fire and the engine explodes, followed by an eruption of flames in the rear of the truck. The explosion brings walkers to the area, and Martha escapes in the van leaving the group to deal with the walkers on foot. Later, Alicia (Alycia Debnam-Carey) and Charlie (Alexa Nisenson) arrive on the scene which is now littered with walker bodies. Charlie can’t understand how the woman on the walkie could do this, and Alicia takes a knee and bows her head as she collects her thoughts and struggles to keep her emotions under control. Alicia and Charlie have a car and a map, but they don’t know where Morgan and the group were heading. Alicia arbitrarily decides they probably headed east. Morgan and his group are walking on the road while being followed by hundreds of walkers. Jim struggles to pull Wendell without wheels, and Luciana is also in bad shape. Morgan sees a sign for a hospital and Sarah agrees that’s the direction to head. Jim, however, believes they should keep moving ahead of the walkers. The group decides Jim can take off on his own, if that’s what he wants. Jim opts to stick with the group. The group makes it to the hospital. Dozens of walkers do their best to break in, and June reports on the injuries to Morgan who’s watching the front entrance. Morgan realizes they can’t stay there long, but June thinks they have to because it has medical supplies and they can catch their breath. Al, Wendell, and Sarah search the building and find a wheelchair, walkie talkies, and other supplies. Charlie and Alicia run out of gas at mile marker 103 and find a truck at mile marker 108. They can’t use it, and finally Alicia admits they’re no longer looking for Morgan and the group. Instead, she’s trying to get Charlie to the beach. There’s no telling how long they have to live, so Alicia wants Charlie to fulfill that one dream as soon as possible. Back at the hospital, Morgan continues to pile up heavy equipment in front of the front door. Jim helps Morgan, thanking him for getting him out of multiple life-threatening situations. As they talk, the walkers manage to break through the glass doors and Jim and Morgan are forced to scramble further into the hospital. Once the group’s back together further inside the hospital, they try and figure out the best course of action. Jim reverts to his old self and blames Morgan for getting them into this situation. Morgan says the answer is to go up into higher levels of the hospital. Walkers follow them while other walkers are already in some areas of the building behind doors. Morgan finally finds a section of the hospital that’s temporarily free of walkers and looks defensible. Items are piled in front of the door, and Al and Sarah head off to check for other exits. They find a stairwell that’s full of walkers behind a padlocked door. Morgan joins them and learns the door’s not going to hold. The only place left to go is the roof, and June reveals hospitals always put their generators on the top floor in case of flooding. Morgan wants everyone to head to the elevator, and he and Jim head off to secure it. They’re attacked by three walkers and Jim gets his first kill after a lengthy struggle that nearly goes south a couple of times. Sarah and Al find the generators, but there’s no way they can both escape before the walkers get in. Al tells Sarah to leave to be with her brother. Al stays behind and shuts herself in a room with the generators as the walkers shuffle forward. June, Wendell, and Luciana can’t hold the hallway entrance any longer and race to the elevators. The walkers aren’t far behind, and Al radios the generator’s almost ready. Morgan can’t believe Al stayed behind alone. Walkers are closing in on multiple sides as the lights come on and the elevator door opens. They take the elevator to the roof which is clear of walkers. Sarah tries to raise Al on the radio, but she doesn’t respond. Luciana believes Al’s resourceful and will find a way to get to them. Walkers continue to walk toward the hospital while on the roof June volunteers to clean Jim’s wound. He thinks he got cut by glass fending off the walker. Unfortunately, it wasn’t glass that caused his injury. Jim has a bite wound. Jim repeats that he has beer to make, initially unable to comprehend what happened. He finally asks how long it will take and June doesn’t know. June and Morgan have a talk and she truly believes Al will make it back to them. Morgan admits Jim asked for his help with the walker. He laughs when June asks what’s next, no longer sure of the correct answer. June reminds Morgan he got them there, but Morgan’s not sure he can get them out. June, however, is. Meanwhile, Alicia and Charlie continue on foot. They’re 100 miles from the coast and Charlie doesn’t want to go any further. 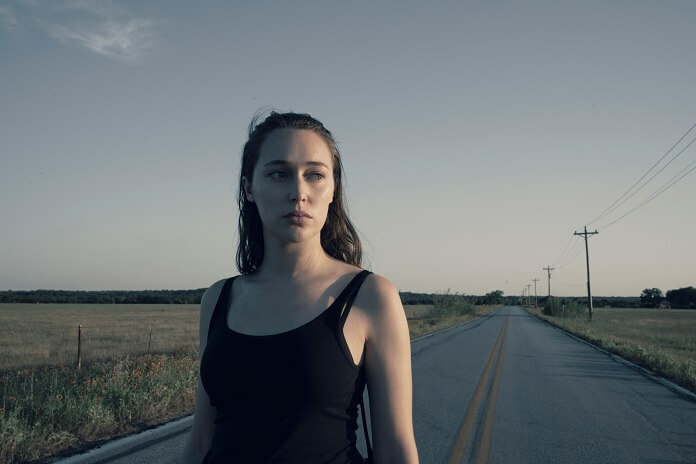 She wants to continue to look for Morgan, but Alicia doesn’t think they stand a chance doing that. She’s determined to get Charlie to Galveston to see the beach. She believes that’s something good she can accomplish, and she admits she just needs something to be good. Charlie agrees that she also needs something good.